Peter Salerno Inc. Presents: Designing With Stainless Steel [VIDEO] – Design Your Lifestyle. If you want a kitchen that’s going to stand out without going the traditional routes, then watch this short video and see how Peter Salerno (and Peter Salerno Inc.) can make your kitchen really stand out with stainless steel! In this video, Peter gives you an exclusive sneak peek inside his Wyckoff, NJ design studio and his production/manufacturing workshop, including private footage of his stainless steel design techniques. Over the last decade, Peter Salerno Inc. has won more North American kitchen and bath design awards than any other design firm, from such prestigious organizations as the NKBA and Signature Kitchens & Baths. Part of Peter’s award-winning kitchen approach is the courage and vision to use bold, beautiful materials in all his kitchen designs, not just one “stock idea” that works well. A 1st place, award-winning kitchen design from Peter Salerno, Inc. now appears in a new design portfolio, utilizing stainless steel. Indeed, stainless steel isn’t limited to just kitchen appliances in an award-winning Peter Salerno Inc. custom kitchen design. Along with Peter’s acclaimed custom reclaimed tin range hood designs, stainless steel can be incorporated as an integral material in his kitchen designs. 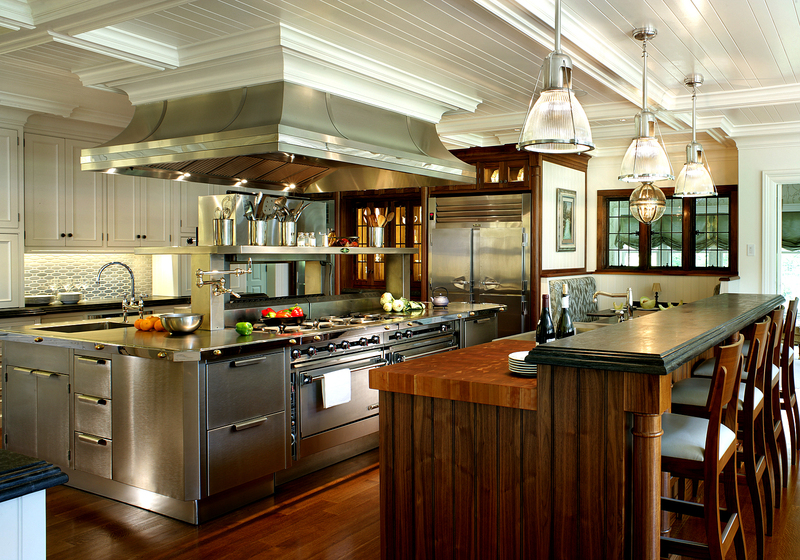 Stainless steel was a vital design element in Peter Salerno’s 2012 1st place Best Overall Kitchen winner through the NKBA, as pictured above. How can Peter Salerno and Peter Salerno Inc. utilize stainless steel (or other stunning design elements) in your custom kitchen design makeover? Fill out the contact form below for more information!